Both the names Cyberdyne and HAL may not be the best names to imply a positive omen for the robotic suit, given the connotation to the Terminator and 2001: A Space Odyssey movies, but the manufacturer says that its improved Hybrid Assistive Limb suit is an ideal fit to provide a human cyborg-type robot assist that can be essential in an environment such as the severely damaged Fukushima plant. "When a person attempts to move, nerve signals are sent from the brain to the muscles via motoneurons, moving the musculoskeletal system as a consequence. At this moment, very weak biosignals can be detected on the surface of the skin. "HAL" catches these signals through a sensor attached on the skin of the wearer. Based on the signals obtained, the power unit is controlled to move the joint in unison with the wearer's muscle movement, enabling HAL to support the wearer's daily activities. […] Not only a 'voluntary control system' "HAL" [also] has a 'robotic autonomous control system' that provides human-like movement based on a robotic system which integrally work together with the 'autonomous control system'. "HAL" is the world's first cyborg-type robot controlled by this unique Hybrid System." The new version of HAL was shown at the Japan Robot Week 2012. In addition to the previous power units and exo-limbs, the new version is equipped with a 132-pound vest made out of tungsten to protect workers from radioactive radiation. Since the vest is largely supported by the powered units of HAL, Cybedyne says it has virtually no effect on the wearing person. There is also a ventilation system that prevents overheating and keeps a worker cool inside the suit. "Radioactive radiation" I did know there was any other kind! Not to pick at you Wolfgang, but radioactive radiation made me a chuckle a bit. (You could have said dangerous or lethal instead, as I know that there are several forms of radiation, Cellular signal for example is carried on one such type). Good humored jostle aside, interesting read. Going to have to do some research into this whole business. I though lead and hydrogen were the best protective agents against radiation? I wonder how they power this badboy. Having to be tethered to a power cable would kind of destroy the whole mobility thing. . . and there's no batteries with enough capacity to keep this thing lifting heavy objects for hours on end while still being small enough to be mounted to the suit. T-51b's got around this problem by way of Microfusion cells. Too bad we don't have those. 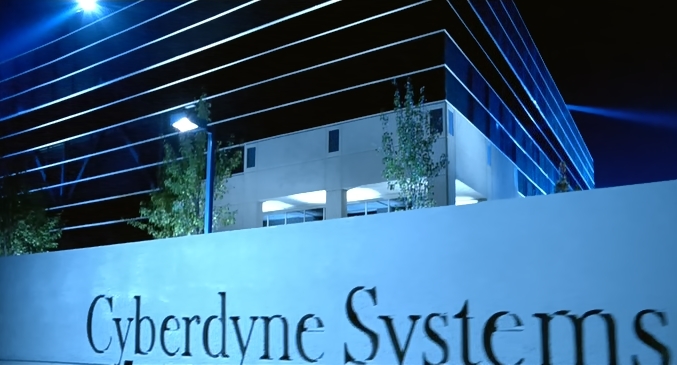 When I think Cyberdyne, I think Terminator. dudemcduderson"Radioactive radiation" I did know there was any other kind! amuffinWhen I think Cyberdyne, I think Terminator. Should we be scared? Judgement day is upon us!!!!! We wouldn't have the funding or the technology for Skynet in the first place. NASA gets about an annual $19 billion budget, US military spends about $20 billion on air conditioning (Afghanistan, etc) annually. Oh look, someone trying to be witty but actually only ending up looking like an idiot! I will take one with a matching crowbar. There is......... i.e. a radio station broadcasting it's consider Radio Frequency Radiation. jkflipflop98I wonder how they power this badboy. Having to be tethered to a power cable would kind of destroy the whole mobility thing. . . and there's no batteries with enough capacity to keep this thing lifting heavy objects for hours on end while still being small enough to be mounted to the suit. T-51b's got around this problem by way of Microfusion cells. Too bad we don't have those. I think the author probably meant to say ionizing radiation, not radioactive radiation. Now can we all move on please? A Bad DayWe wouldn't have the funding or the technology for Skynet in the first place. NASA gets about an annual $19 billion budget, US military spends about $20 billion on air conditioning (Afghanistan, etc) annually.We're a welfare-warfare country. DUDES!! Seriously that NAME, IN JAPAN!!! !, thats a bad combination!!! How about Beta, Alpha and Neutron radiation? All particles. Cyberdyne!! this is just one more step till the machines take over! Our grand kids, grand kids will be fighting the terminators! The end of the world! The movies just got the years wrong! We're all doomed! AAAAHHHAHHHAHHAHH!